Our concentration on local schools continued with visits to Hermitage Primary, Burghfield St Mary’s and Springfield Primary. And in between visiting these lovely schools, we still somehow managed to work with our fab set of Year 3’s at Francis Baily Primary School where I’m currently their ‘Author in Residence’. So a busy week to say the least. 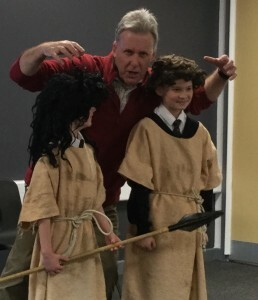 Hermitage Primary are ‘old friends’ and it was great to be back with them again, this time performing our Bonebreaker presentation to a keen KS2 audience. The children participated really well and the atmosphere in the hall was ‘magic’. Part 2 of the presentation was centred around our super-scary short story collection – Ten O’ Clock Caller, and again, this went down a storm. I suspect after our mega book-signing the next day, many avid Hermitage readers were careful to read in bed AFTER ten O’ clock! Burghfield St Mary’s and Springfield Primary are new to us and it’s more than pleasing to report that both schools were a real pleasure to work with. 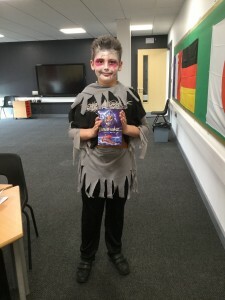 We’ve since heard from staff and parents that the children are still ‘buzzing’ about our books and that lots of reluctant readers now have their heads buried in our spooky novels…GREAT! That’s what it’s all about! Thanks again to the staff and pupils for making us so welcome. The following week found us heading down to Kent to work with a cluster of schools under the heading of the Valley Invicta Schools. Ms Sarah Bone is our ‘hostess with the mostess’ and she now books us annually for National Story-telling Week to visit her four schools. Three of the four schools are brand new as part of newly developed housing projects in the area. It’s very exciting for us to ‘grow’ with the schools and each year our KS2 audience will increase…lots of new fans in the making! 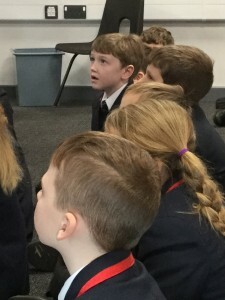 This year (our second year), our son, Simon, made the journey with us and he enthused and entertained the younger KS1 audiences with his colourful Icky Doo Dah books. We felt very proud to hear the amazing feedback he received during the week and he has already been booked to return with us next year. Yeah….keep it in the family…that’s what I say! receive a beautifully hand-written letter from one of my biggest fans at Aylesford Primary and I’ve decided to frame it for my office wall. A BIG ‘thank you’ to Josie…good luck to you and the other pupils currently entered for the BBC 500 words writing competition. Thanks also to everyone at Kings Hill, Leybourne Chase and Holborough Lakes for ensuring we had such a ‘brill’ time. Can’t wait to see you all again next year. Well…it was back to rural Berkshire to fight off cold and flu germs before travelling back up North, in readiness head on up to Bradford to work for three days with Whetley Academy. This school single-handedly inspired much of my latest Kruschmeister book, so I can’t wait to get up there and tell them all about it! Oops…it’s snowing as I write…hope we make it!